I think Miss Bossypants Jefferson might not be entirely happy about the new addition. Because even though I've been pretending otherwise, I think my tiny green baby budgie is figuring it out, that she's not quite the only ruler of my world now. Your new conure is very pretty. What have you named him/her? Hopefully you have the Conure caged in a separate cage in a different room than the budgies? Quarantine means housing the new bird in a different cage in a different room than the current birds (as far away from the room the current birds are in as possible) for a period of 35-45 days. Your conure is going to need to be caged separately from your budgies on a permanent basis. Additionally, you should not allow them out-of-cage time together as the Conure is much larger than your budgies and can very quickly seriously injure or kill them. I find conures to be beautiful birds that I've considered getting one day myself. However, I've heard sun conures can be a bit loud and high maintenance. I'd be curious to see how things go with yours. Please keep us posted. I live in an apartment, so I can only see myself getting a quieter variety of conure near future, such as a peach front or green cheek. But the fact that these birds should probably not have play time in the same room with budgies also poses a space issue. I agree with Deb and suggest being careful not to leave your budgies and conure alone together. The size difference is just too dangerous. Congratulations on your new little cutie! Suns are so beautiful in the mature adult colors. 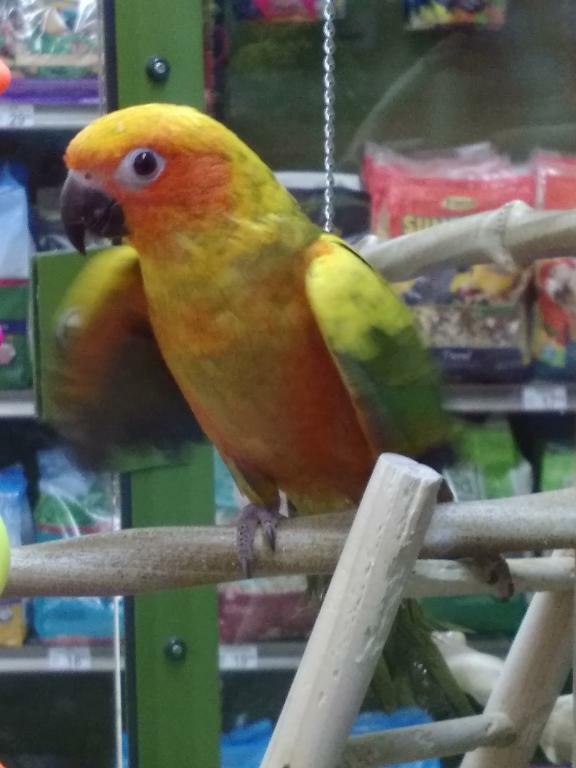 Even the smaller parrots like conures have lots of behaviors that differ from budgies, so joining a forum for parrots to learn all you can will be beneficial .